When your ship and fellow crew members are destroyed during a routine mission by space debris, you are rescued by the one laborer-class android who happened to be nearby... Now the two of you must spend an entire three-month journey alone with each other aboard the small, maintenance ship that is taking you back to civilization. 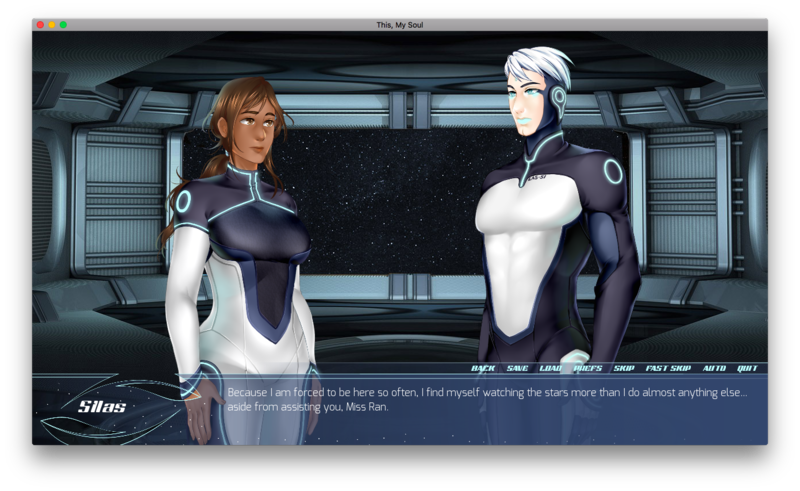 I seem to be reviewing a lot of sci-fi visual novels lately. 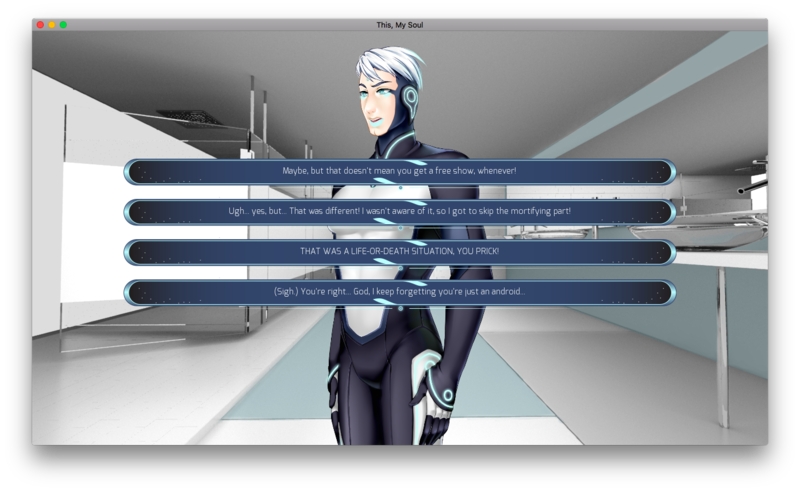 Either that or this year's NaNoRenO is just filled with sci-fi stories? Yeah, perhaps that's it. Let me start with the disclaimer that I love any and all topics regarding AI. I mentioned that before in my blog, actually, in my review of the visual novel AMI. My interest in AI started from my interest in computers, and that includes both fiction and non-fiction topics. As long as it contains AI, count me in, I'm interested! Anyway, with that out of the way, let's begin with the review. The story begins with a black screen... and the main character figuratively hanging on for dear life. As soon as she wakes up from her 'nightmare', she's informed by the Living Artificial Synthezoid that she has been sleeping for a month and sixteen days. They still have a little over two months before they arrive at their destination. Now it's up to her to make the most of out of her time in the ship! Problem is, her one and only companion is an android... who's becoming less and less of an android to her and more and more of a potential love interest. Yikes. Can I just say, I absolutely loved the interactions between the MC and the LAS! An LAS is basically a sub-category of android, built to look and feel as human as possible. I love LAS-51, also known as 'Silas'. He can seem a bit insensitive at times, but as an android without a social sensitivity chip, that's only natural, isn't it? At least, that's what I kept telling myself throughout the whole game, as he felt human enough to actually pass for an actual human being. The only difference was that he wasn't capable of human emotions... or was he? It was really frustrating at times to interact with Silas to be honest, because no matter how much I try to make things less awkward for him MC, we always seem to go back to square one, each and every time. Man, I can't even clean up the mess that is my lovelife in real life, and yet here I am, still unable to fix things with my in-game character and her love interest. I'm hopeless, aren't I? But anyway, back to the game! Despite my frustrations, I absolutely loved every scene between the the two of them. Silas is such an interesting character and I found it very hard not to fall in love with him, even though he was a robot. And even though I wasn't entirely sure where the route was going (Yes, even though I tried to make the 'correct' choices that would lead to a romance ending, I still wasn't sure if I'd be able to get it. This game, or rather, Silas, is that unpredictable.) I simply let myself to be carried by the story. It seems like a made the right choice, because I was already in near-tears by the end of the game. This is totally one of the most heart-warming (or heart-breaking depending on which ending we're talking about) NaNoRenO games I've played in a while! I don't want to give any spoilers, so I suggest you just try it out for yourself! I greatly enjoyed the writing. It's descriptive in just the right amount, and the interactions between the MC and Silas felt neither forced nor contrived. I really hate stories where the MC is being pushed to fall in love with the love interest sooner than later. Like, come on, give them some time to breathe, okay? In This, My Soul, their relationship developed gradually, even painfully slowly at times. Which I like way better than whirlwind romances, as that kind of relationship development also usually shows character development as well. Plus, I love how there were so many choices! I would've been fine even just as a passive reader, but I think the level of participation that was required from me only increased my liking for Silas. The only thing I didn't particularly like is that it's written in the 2nd-person-POV, as I usually avoid those. The art is pretty good, although it's not really my cup of tea. Or in other words, it's not the manga art that I've grown to know and love, haha. Nevertheless, both the backgrounds and the character sprites are not too shabby, especially for a NaNoRenO entry. There are some CG scenes, but not fullscreen ones. They look like the kinds used in The Thing of Mistletoes, to be honest. They're a lot easier to make and implement than the traditional fullscreen CGs, to be very honest. Oh, but in this case, I did notice that the CG scenes seem to have a different - and nicer - art style than the sprites, so perhaps the artists are different as well? I'm not entirely sure. 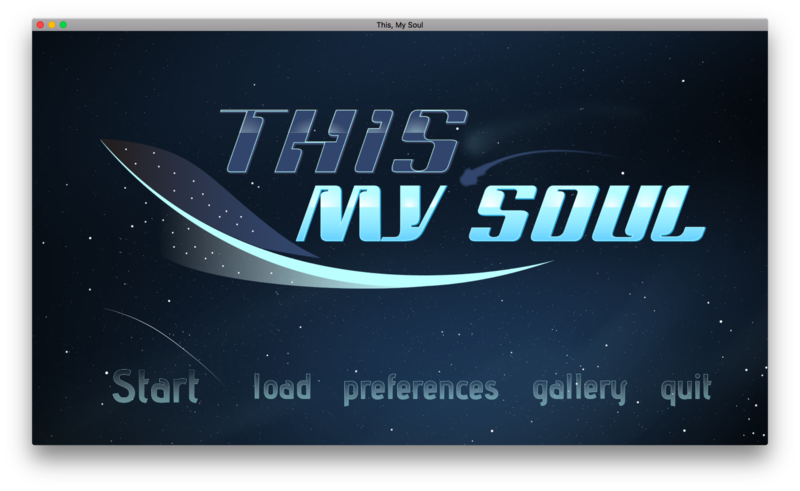 The GUI is actually my favorite part in this whole visual novel. 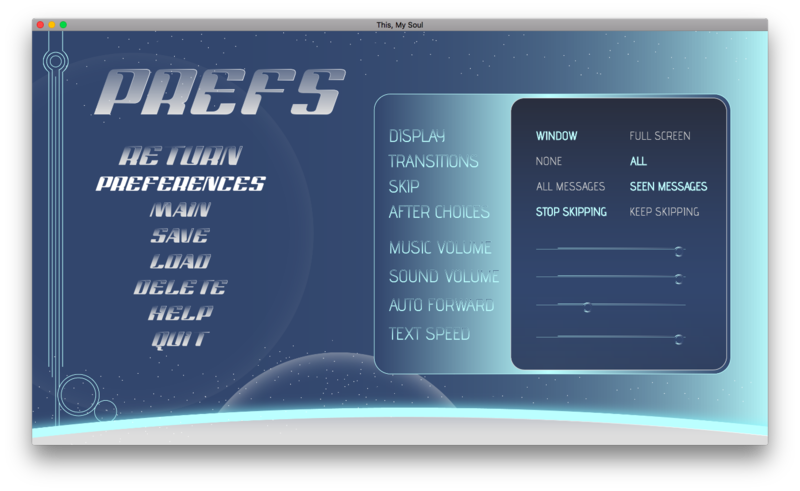 It looks very clean and seamless, perfect for the sci-fi theme. The buttons all work perfectly too, so... yeah, that's pretty much it. I find the music really soothing to hear. Unfortunately, I can't comment much on it, as I played majority of the game while I was outside the house, without earphones. Mostly while I was in school, in between my classes, heh. But what little music I heard was really good and seemed to match the scene it was in, so that's a plus I guess. This game was certainly a pleasure to play. I totally enjoyed it! I've always said that I'm not a fan of sci-fi, but as a fan of anything AI-related, this totally resonated with me. 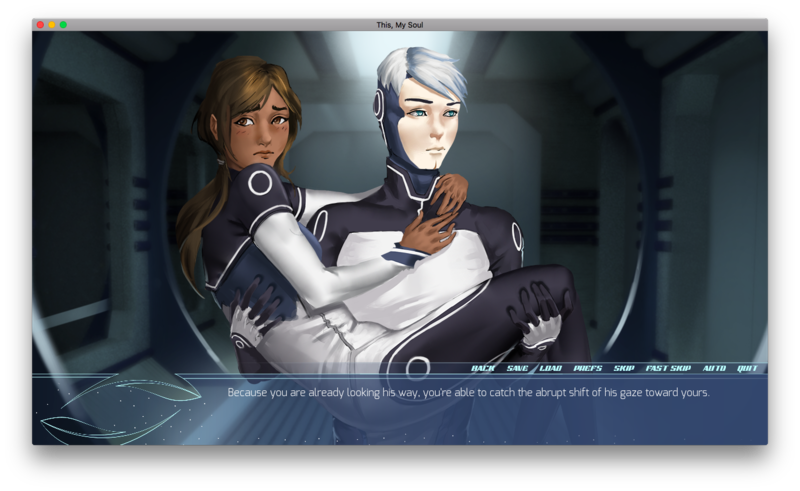 I can't decide whether I like this one or the other sci-fi visual novel, Pairs, that I reviewed recently, better. They're both pretty good, for a NaNoRenO release. Heck, I wouldn't even have thought they were NaNo released if it wasn't mentioned on their pages. Nevertheless, I'm giving this one eight strawberries, a berry higher than Pairs, for the excellent storywriting and relationship build-up. Visual novels are called 'novels' for a reason, after all. And even though the art of this game isn't as stellar as other titles out there, what's important is that it made me feel something while playing the game. Something good. Something warm. Something nice. Something that will stay in my memory for quite some time. And what's life other than a series of emotions and memories, right? You can try out this game here.